When I began home schooling my kids I let them know they'd have the choice of going to high school or home schooling through high school. Of course, when they were starting first grade this was an easy offer to make, it got a lot more "real" when the time came to make that decision! This year Adam begins high school and has decided to stay home and home school instead of entering the high school his older siblings attend. He will be the third child to spend at least a part of their high school years at the kitchen table. While I've got a pretty good idea of what Adam will study this year I always want to learn new things and be a better teacher, so when I was asked to review The Conversation, a book by Leigh A. Bortins focusing on providing a classical education to high school students I was more than willing to check it out. The 267 page paperback book is published by Classical Conversations. I didn't know this until after getting through the first chapters of the book but Leigh A. Bortins is the founder of Classical Conversations, a homeschool support organization of sorts with a following of over 62000 students and 8000 parents. I don't personally know much about the program/system, having not heard of it before, but you are welcome to gather more information here. The Conversation focuses on teaching high school students through a classical, Christian approach. The book begins by addressing the concerns many parents have teaching high school - and there are worries, even as a more seasoned high school teaching parent with access to online classes I question whether I can guide Adam to learn all he needs to know to be ready for college and the real world while still enjoying learning. The book then moves on to guide the reader in what and how to teach high school; with chapters on Reading, Writing, Math, Government and Economics, Latin, and more. Finally, the book finishes with some real life applications, from games to resources to observations from parents. The goal of the book, I believe, is to empower parents with the confidence and knowledge to teach their high schoolers, and to give parents the motivation to go beyond the basics in their teaching. While the author doesn't hand the reader the exact ingredients (ie - reading lists, specific curriculum to use, etc) of successful high school homeschooling she does provide plenty of ideas and examples of how to teach these subjects in a classical style, moving beyond the basics to teach with a focus on rhetoric. We are very eclectic, laid back home schoolers who've always loosely followed a classical approach to education. This is my 14th year teaching kids at my kitchen table. I add and remove curriculum as I see what works for the kids and I have a good idea of what we can do in a day. That said, I was initially very turned off by this book and struggled to read beyond the first thirty or so pages. I felt the author presented a more-than-perfect home school life early in the book that just wasn't attainable or realistic, at least not in my experience. It just didn't work for me. Knowing I had to write this review I kept reading and found myself more interested in the chapters focusing on specific subjects. Immediately after reading the Reading and Writing chapters I wrote out Adam's reading list for the next four years, a pick and choose list of great books we'll read, disect, and write about. This book provided motivation and excitement to get that list going. I do think the "meat" of this book is a good resource for high school home schooling and I'll refer to those subject-specific chapters when we start to veer towards rote work and boredom (it happens, usually right before Christmas, when we just want to get stuff done, and we forget to make time for the creativity and exploring and discussing that's so important in learning). 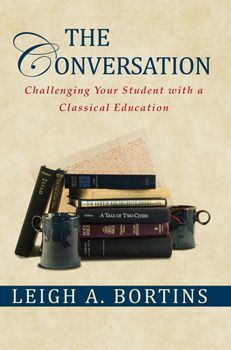 The Conversation, by Leigh A. Bortins, is available from Classical Conversations.